Controversy Stirred-Up Over Reggie’s 1977 3-HR World Series Jersey & Babe Ruth’s Last Uniform: Did Mr. October Pull A Barry Halper Or Was Famous Uni Lost In Fire? 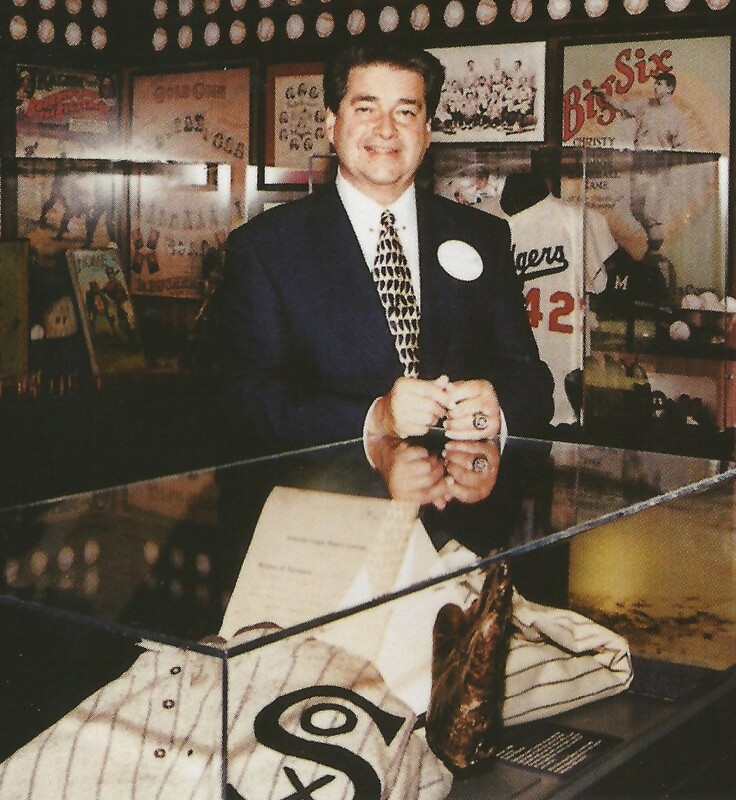 Barry Halper stands above the bogus "Shoeless" Joe Jackson jersey he sold MLB and the HOF for over $1million in 1998. The "Jackson" chain stitched name was forged. Sometime since the catalog was sent out to bidders Heritage has removed the Barry Halper name from the online description to the jersey referring to him now as just a “noted collector.” No doubt Heritage (and possibly the consignor) realized that an “ex-Halper” provenance is no longer a plus for garments that were once owned by the deceased Yankee partner who has been linked to scores of documented uniform frauds and forgeries including the counterfeit “Shoeless” Joe Jackson jersey he sold to MLB and the Baseball Hall of Fame for over $1 million in 1998. That jersey had an “enhanced” chain-stitched name of “Jackson” in its collar. 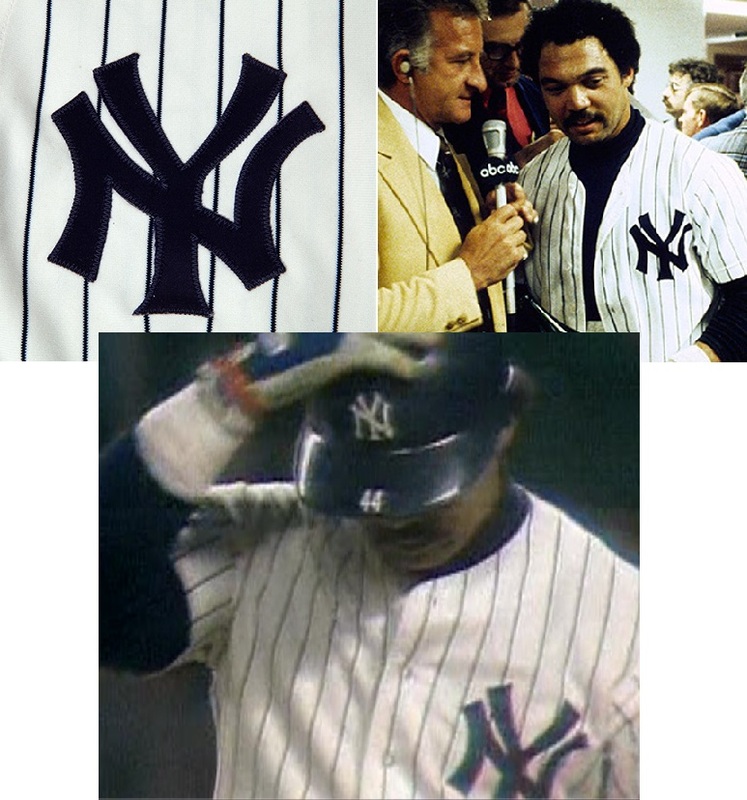 Reggie's alleged 1977 WS jersey from game six (top, left) matches the one he wore in the clubhouse with Bob Uecker after the game (top, right), but the jersey he wore on the field shown on game tape (bottom) is not the same Yankee pinstripes. JET Magazine published pictures of the remains of Jackson's house (top) and reports published in newspapers (Wisc. 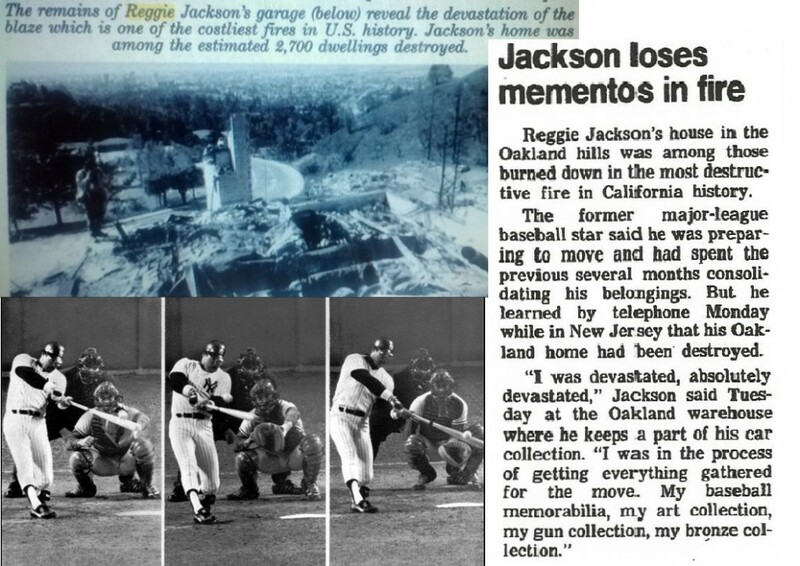 State Journal) stated Jackson had lost his "baseball memorabilia." Could he have lost his 1977 WS jersey in that 1991 fire? Could Jackson’s actual 3-HR jersey have been destroyed in the 1991 fire that obliterated Jackson’s house and did Jackson know that the jersey he consigned to SCP was not the actual jersey he wore on that fateful October night in 1977? It appears that the Yankee pinstripe jersey being offered by SCP is the same jersey that Jackson is wearing in the clubhouse after the game, which would also suggest that Jackson didn’t lose all of his memorabilia (including that particular jersey) in the fire at his residence. Kohler and SCP stressed that they hold themselves to the “highest standards of integrity and diligence with regard to authentication, and deeply regret any inconvenience this has caused our valued clients.” At the time the Jackson jersey was pulled from the auction bids were approaching $215,000, according to SCD. Current standards for uniform authentication are much more stringent than they were at the time when Barry Halper was considered the “King of Collecting” and sold off his collection at Sotheby’s. Items with a Halper provenance now must be scrutinized even closer considering the large cross section of fakes and misrepresented garments that have entered the marketplace. Considering Halper’s fakes fooled the Baseball Hall of Fame, MLB and major auction houses, Heritage now finds itself in a bind with its current offering of what they allege is “Babe Ruth’s Final New York Yankees Jersey.” The jersey was originally sold at Sotheby’s as part of the Barry Halper Collection and the Halper provenance was specifically noted in the Heritage Auction catalog. The Heritage Catalog description of the alleged Ruth jersey mentions the Halper provenance as did the online lot description. Heritage has since removed the Halper attribution from the online offering. Despite that inclusion of Halper’s name it appears that Chris Ivy and Heritage have withdrawn the Halper name from its lot description choosing to refer to him now as “a noted collector” instead. Heritage’s claim of Halper’s enhancement of the garment with the “Babe Ruth” chain-stitch is also concealed and is also attributed to a “noted collector.” How Heritage determined that Halper himself had the Ruth chain-stitched name added simply to enhance display is not known especially since Halper died back in 2005 and is currently unavailable for comment. Barry Halper's jersey attributed as the Bambino's last features a chain-stitch that appears to have been added much later and is not consistent with stitching added by the Spalding Company. It is more likely that the chain-stitching was added to the jersey to fraudulently enhance its value and bolster the claim that the garment was actually issued to Ruth. That would match the description of scores of other Hall of Famer jerseys in the Halper Collection that sold at Sotheby’s. The auction house sold off hundreds of thousands of dollars worth of bogus jerseys attributed to players who were identified with similar fraudulent chain-stitching that has been determined to have been added to the garment at a much later time. Jerseys attributed to Mickey Mantle, “Stan the Man” Musial, Eddie Cicotte, John McGraw and other 19th century players like Buck Ewing and Wilbert Robinson all turned out to be fakes featuring doctored or deceptive chain-stitching. The chain-stitched names in Halper's Joe Jackson (top, left), Eddie Cicotte (top, right) and Wilbert Robinson (bottom) jerseys were determined to have been all added fraudulently well after their manufacturing date. The 1951 article doesn’t specify whether Helfer was gifted an actual Yankee uniform and doesn’t mention the year of the uniform or whether Ruth ever wore it. The provenance story is vague and considering Halper’s confirmed history of fabricating and embellishing provenance stories, it is difficult to put much faith in the magazine article and the unauthenticated letter allegedly written by Helfer’s widow. If Halper went as far as fabricating a false-story that he traveled to the home of “Shoeless” Joe Jackson’s widow to purchase his 1919 White Sox jersey and “Black Betsy” bat, how can Heritage and its consignor be so sure that the story linked to the alleged Ruth jersey is legitimate? This also considering that Heritage in its lot description has already admitted that the jersey itself has been altered and enhanced with the addition of the “Babe Ruth” chain-stitch in the collar. How can Heritage know that the Ruth chain-stitch isn’t a calculated fraud similar to the Ruth chain-stitch found on the inside collar of the fake 1920 Ruth jersey Halper claimed to have acquired from ex-Brooklyn Dodger Ollie O’Mara? Has Heritage tracked down the Helfer family or relatives to verify the story? When Haulsofshame.com tracked down Ollie O’Mara’s son in Reno, Nevada, he claimed his father never had a baseball uniform collection and never sold materials to Barry Halper. Several Halper fakes with a fabricated O’Mara provenance were sold along with the alleged 1935 Ruth jersey at Sotheby’s including Baltimore jerseys attributed to Wilbert Robinson and Hughie Jennings. 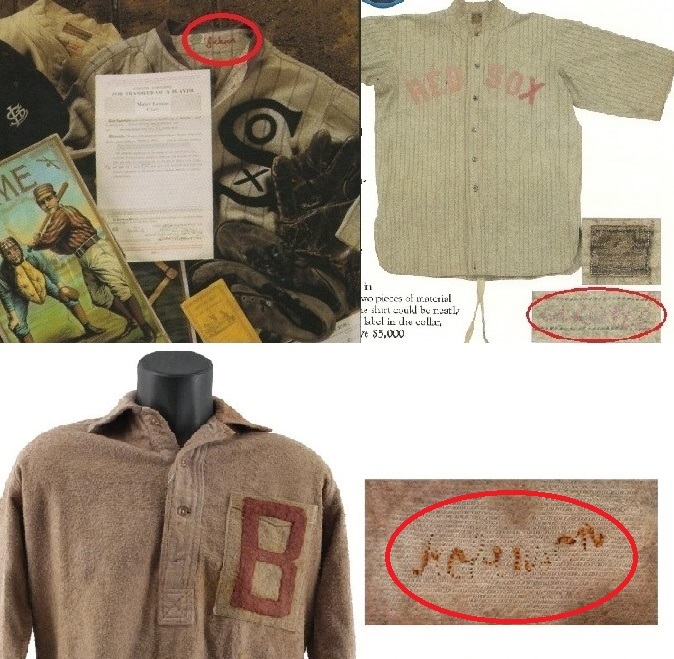 The Robinson jersey sold for $27,600, however, when it sold again at Legendary Auctions nearly a decade later it sold for only a few thousand dollars as an old jersey unattributed to Robinson even though Robinson’s name was chain-stitched into the garment. Comparisons to authentic Baltimore jerseys form the period also confirmed the fact that Halper’s alleged treasure was bogus. Will Heritage’s questioned Ruth jersey attributed to Ruth in a year he didn’t even play meet the same fate as Halper’s bogus Robinson? Is it just a generic Yankee jersey that was coupled with a good story in a magazine? Did Barry Halper add the chain-stitched Ruth name to create another Halper-special? You can’t really blame Heritage for wanting to hide the Halper provenance considering that the Baseball Hall of Fame has even removed the “Barry Halper Gallery” from its museum. That’s the same gallery space where the fakes attributed to “Shoeless Joe” were exhibited to Hall of Fame visitors for years. Another great article keep up the great work Pete!!!!! I blame Heritage strongly for omiting Halper’s name from the lot description. It’s clearly misleading, considering his name was originally included. I once won an item in a Heritage sale that turned out to include Halper provenance, although I wasn’t made aware of this until I received the item in the mail (the item was relatively cheap and low risk for forgery, otherwise I wouldn’t have blindly purchased it). It should also be noted that the controversial circa 1940 Lou Gehrig single signed baseball discussed in a previous HoS report that was withdrawn from a Heritage sale has made its way back into their new sale, with a 1939 date attached to it. Of course, no mention of the previous controversy can be found anywhere in the lot description. I dont find any of these new findings a surprise, cause everything that ,that crook Halper had was either stolen or forged.I just feel sorry for the fans that have worthless junk and paid big bucks for. Has Reggie confirmed that he switched jerseys? Seems odd that he wouldn’t have brought that up that he wore two jerseys. Can you document Reggie’s relationship with Halper? Reggie’s memorabilia collection is world class. Halper told several stories about Jackson, one of which being how he got Reggie to sign his alleged 500 HR signed sheet which featured a forged Babe Ruth signature. I don’t have any knowledge of other items in Jackson’s collection and was only referring to this particular jersey and the “pulling a Halper” possibilities with that singular jersey. Obviously, there are many unanswered questions regarding this situation. The story made the New York Post today. Very well done. Please keep up the terrific investigative sports memoribilia journalism. It is clear Barry Halper was a complete fraud. It’s kind of weird and frightening that this guy got away with some much deception for so long a time. Hopefully, the sports memoribilia industry has matured in the years since Halpers time in the business. This Reggie Jackson jersey sale is troubling too. Did Jackson know the jersey was not his game worn WS jersey? I have a vivid memory on being at an east coast card show in the early 1990s and being told by the people running the show not to even offer Jackson condolences about his house fire because he was very upset at his losses in the fire. cleanup in the front office and locker room. steroids in the Berkeley Hills. I just got my REA catalog down here and even i cant believe Lifsons stillgoing with my thank you letter on the inside cover. Oh well, lets go Yanks! If the “photographic evidence” used for the jersey was a picture of Reggie being interviewed by Bob Uecker, I’ve got news for you. That is NOT, repeat NOT a picture from the 1977 World Series celebration it’s from the postgame of Game 4 of the 1978 ALCS. How do I know this? Beacuse I have copies of the telecasts of these games and Bob Uecker was NOT part of ABC’s coverage of the 1977 World Series. The postgame locker interviews were done by Bill White, and it was White who interviewed Reggie.